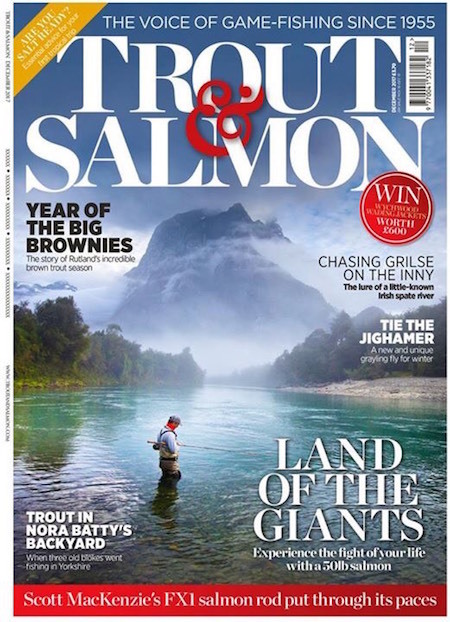 I was e-mailing a friend the other day, talking about the sad state of British Columbia’s Thompson River steelhead fishery (if you can call it that anymore) and he sent me a cover shot of Trout & Salmon magazine that looked real familiar. 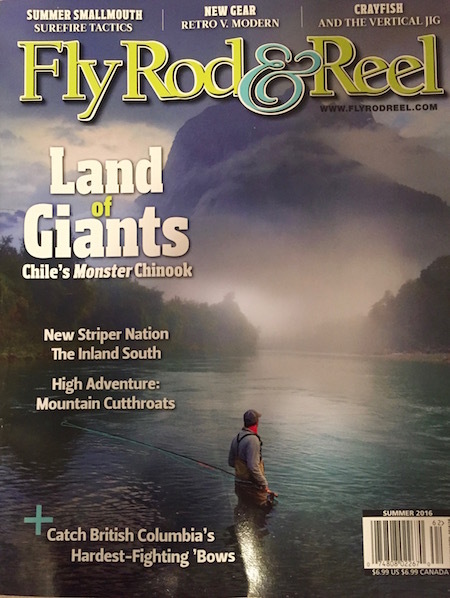 In fact, the cover looked almost identical to the cover I chose for the summer 2016 issue of Fly Rod & Reel magazine . . . down to the near exact coverline, which on FRR’s cover reads Land of Giants and on T&S’ cover reads, Land of The Giants. This is something that goes on all the time in the creative world and this is not something new to me—throughout my time at FRR editors repeatedly mimicked our covers and interior images, and even ran articles nearly identical to what appeared in FRR. I haven’t looked at T&S so I wonder if the interior pages and the article are actually the same as what I ran in FRR. If so, that may be as simple as a case of a writer reselling his or her work and that is perfectly fine. But the cover thing. That bothers me. Realize, people didn’t just copy FRR; I have a network of top editor friends who complained about the same thing and singled out particular people who repeatedly failed to show any creativity. In the small fly fishing world those things don’t go unnoticed by editors or the readers. When putting together FRR, and previously when helping to build Big Sky Journal and Tight Lines I always tried to come up with unique ideas (like which flies you could tie from commonly encountered road kill animals, for one). The last thing I wanted to be known as is a copy cat. To me, surprising the reader with something new is part of the fun. Why do something that’s already been done, I asked. Why not take the position of editor and try to create something fresh and fun for the readers? Why just take a backseat and copy people? That’s boring in my mind and doesn’t tap into the creativity most of us share. So, when I run across a magazine mimicking what I have done, or what someone else has done, I always try to accept it as flattery, but deep down I just have to wonder if the person in charge even belongs there. If creativity isn’t part of a magazine’s equation, why does it exist? So, how did I come up with creative ideas? As I like to tell people, I do my best work laying on my back. That’s because I’m always more creative resting on the couch with my eyes closed visualizing things. A half-hour with the mind free of visual distraction goes a long way. I also scoured magazine racks and looked at titles outside the outdoors world. Food, travel, niche sports, art, politics, etc. Looking outside of our narrow world opened up all sorts of possibilities. How could I do something similar, I asked, but in a very creative way, that served my readers a fresh plate? So, whether you are trying to be creative for a project in school, or you run a blog or e-mag or an actual print mag, try these tactics and see if they work as well for you as they do for me. This entry was posted in Books, Culture, Industry and tagged Copying in the Media; is copying flattery; media copying. Bookmark the permalink. As an guide/writer and editor of a local steelhead magazine, I found this article about the Land of Giants cover on T&S interesting. I subscribe to T&S. Its an iconic scene, I presume the photographer is Matt Harris. I would think an editor would communicate their decision to use a photographers photo on a cover with the photographer who might then inform the editor that its just been used! I doubt T&S had any intent of copyinging anyone, they saw a beautiful photo, I suspect either Harris of the lodge operator have been using the tagline for a while.